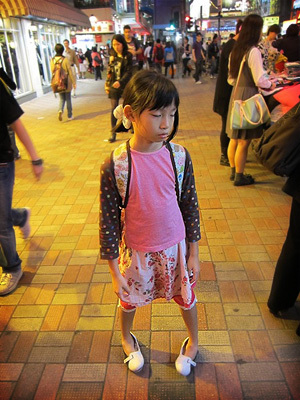 I stumbled upon Initial Fashion when I�visited Hong Kong recently. 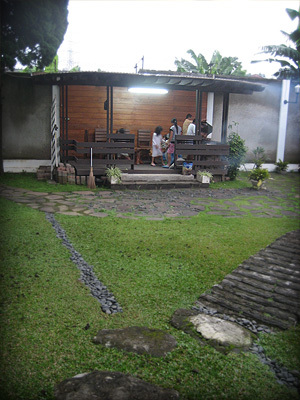 From outside, it looks warm and has this rustic charm thats inviting with a dash of stylish sophistication. After a few minutes browsing the racks, I saw a suit that i really liked. I’ve been shopping for a good suit since I started working, but i’ve never found anything that I liked… until now. It fell into the no-need-to-see-price-tag category. The well dressed salesman came forward to provide�assistance�and advised me to try it on. He provided me a matching shirt and the full suit in my size. Off to the fitting room I went. The girls were well entertained by the other sales people in the store. They were all not only well dressed, but were also really polite and nice. One of them have kids too, so he really chatted with the kids. 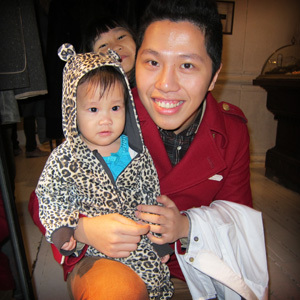 Also, everyone was naturally drawn to the cute little leopard (wife bought the outfit from H&M). I tried on the suit and loved it. It was a khaki coloured one, but I really needed a black one for work. Damn… I manage to find a super nice black one too. back to the fitting room I went. Ah Hai, the sales person that was attending to me explained the little details on the suit to me. The way the shoulder part was done in a non-typical way. The way the back of the suit was also special, etc. He then asked me where I was from with the purpose of advising me how the suit will work out in the climate back home. The khaki one will be good, but the black one could be slightly warmer as its from the Fall/Winter 2011 collection. I kinda don’t like being cold, especially when I’m at work, so it was ok. I really�appreciate�the advise and this have always been the kind of customer service that I feel should be given by those who love what they are doing. I ended up walking away from the store paying for 2 full suits and a free pair of leather shoes.�Apparently�with purchases up to certain amount, customers were entitled additional cash value which can be used to make other purchases. So for me, it worked out just nice to a pair of nice leather shoes. They had to alter the length of the pants, so I came back the next day to pick them up. I’ll definitely be back and really hope they open a Store in Singapore soon. 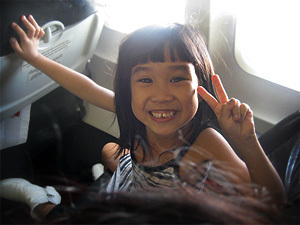 This is the long awaited trip that the kids were looking forward to. 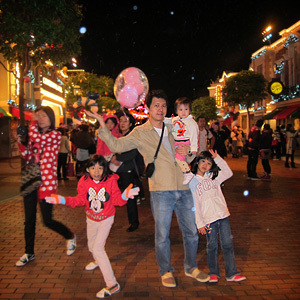 7D6N Hong Kong + Disneyland! When we landed in HK, we took a private bus to our hotel. 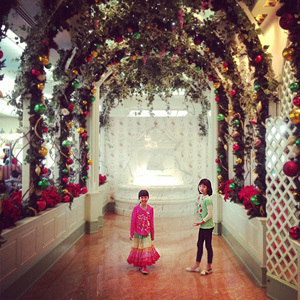 This time we stayed at the Cosmopolitan Hotel near Causeway Bay. The hotel provides free shuttle service to Time Square, so its still kinda�convenient. 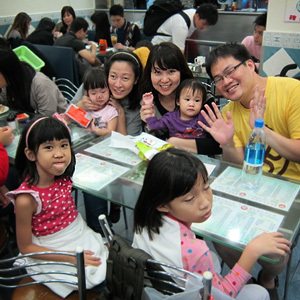 We did not do much on the first day as for this trip, we planned to have no plans and just chill and relax and enjoy Hong Kong. 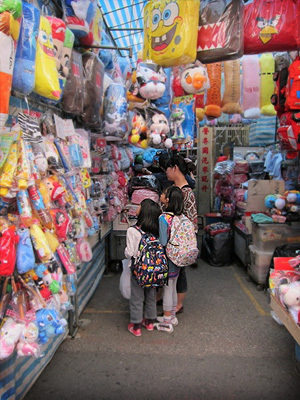 We went to Ladies Market as usual and just strolled the streets shopping for random stuff. We bought iPhone accessories, bags, boardgames, basically very very random stuff. Clara slept most of the shopping parts as it was her nap time + its not so exciting anyway. 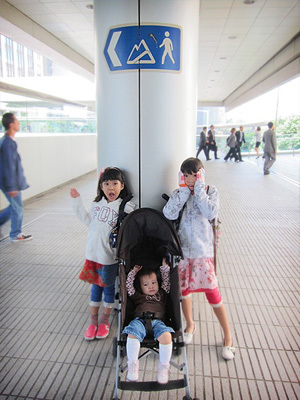 I tell you, go hong Kong with baby, better bring stroller, else if you carry your baby, you will surely not enjoy the trip. I’ve learnt my lesson from my 2008 trip where I had to carry Cleo most of the way. According to my colleague Wei Li, Ho Tin Wan is to die for, so we got a queue number and after 2 hours, we got seats. Pearl and I never queued for stuff, but since we are already here we might as well give it a go. Not too bad. 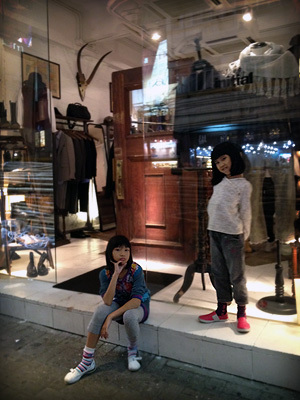 That evening, we walked into Initial Fashion at Causeway Bay and after trying on a few suits, I walked out with 2 full suits and a pair of shoes. OMG. I will blog about this�separately. 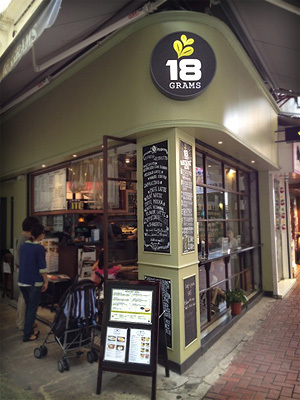 I did some�research�of nice places around Causeway Bay for coffee and 18 Grams came up. Since its not too far from Times Square, we walked there. It was a wonderful breakfast. We ordered a full breakfast with bacon, toast and eggs. The coffee was great too. 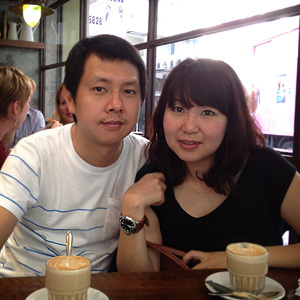 The past few days have been too much walking and shopping, so just to chill out at a cafe was really nice. We somehow went back to Ladies Market again. 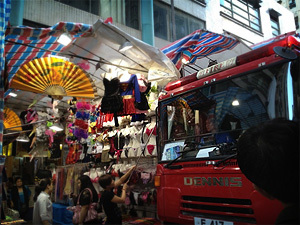 It was random shopping once again and half way thru, a fire engine wanted to pass thru. The street is so small, I never expect that a full sized fire engine could pass thru. But apparently its a regular thing as fire hazards is a real issue there. Anyway, it seems that the hawkers there are used to such checks as they all lined the streets to retract their stall extensions. Its quite a sight.�I heard�from the news�that the very next day, a fire broke out and nine people died. :( Its a real sad news, but thank God we missed it by a day. 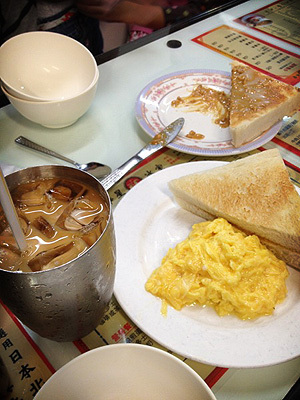 Again with some proper research, I found out that Capital Cafe was also very well known in the area. The food was simple and fantastic. We ordered the basic set and because it was so good, we actually came back the following day. Day 4, I decided that we don’t do anymore shopping, but do the Mid Level Escalators and The Peak. We took a tram to the base of the escalators and after many many many escalator rides and crossing many small streets, we finally reached the top. According to the map, we just needed to walk about 20 mins to reach the Tram Station to go up to The Peak, so I decided we brave it. 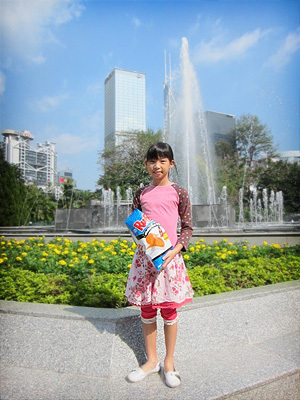 The map also showed that we will be passing the Hong Kong Zoological and Botanical Gardens, so why not. It looks like it will be an interesting walk. Little did I know that the 2D map did not really show the number of hilly roads and steep slopes we had to walk pass and it was challenging especially with a stroller. Good thing was that Clara was asleep. 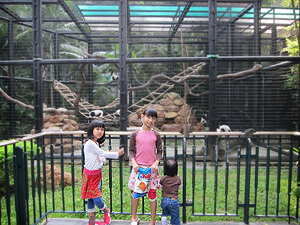 When we reached the Zoo, she woke up and just in time to meet the animals. Just a short stroll away, we reached the Botanical Gardens. After being to the one back home in Singapore, I have to say this one is really small. 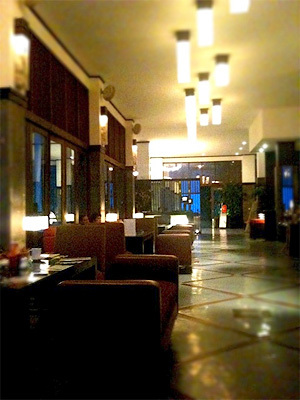 But kudos still to the�management�as the place was very well kept and really comfortable. 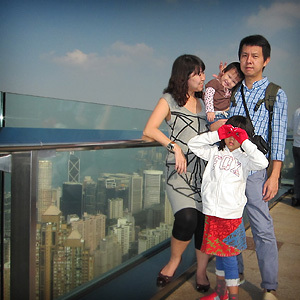 Finally, after so many trips to Hong Kong, we finally did the tourist thing and went up to The Peak. It had a nice view, but really no big deal lor. We ate at BubbaGump which was themed after Forest Gump. The food was nice and the view is of cause amazing. We walked over the The Peak Galleria and chilled. 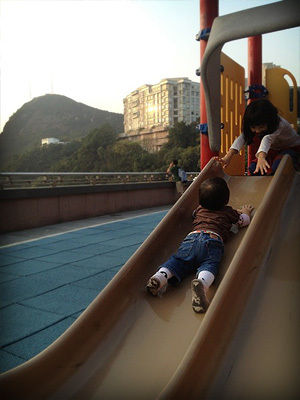 The kids had fun at the playground and we just sat there till sun set. Really nice. 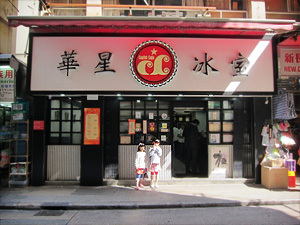 Once we got down from The Peak, we took a taxi back to Causeway Bay as I needed to pick up my suit form Initial Fashion. The kids were super tired. So so super tired already. Now the trip really started for the kids. Its Disneyland time. 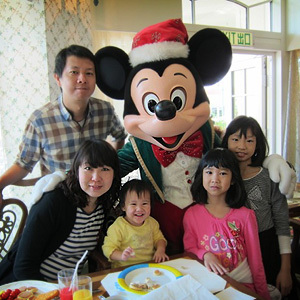 We took a taxi from our hotel to the Disneyland Hotel. 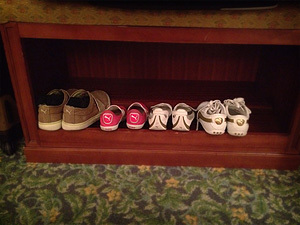 The last time we stayed at the Hollywood Hotel, but I think after experiencing both, Disneyland Hotel is better. Clara saw a HUGE Candy Cane and ran up to it to hug it. She did this a few times actually. So so super cute. The new addition I heard was Toy Story Land, so that was the first thing we went to explore. The place was cool. Lots of the stuff from the movie was made into rides. I think the plastic soldiers�paratrooper ride was the coolest. 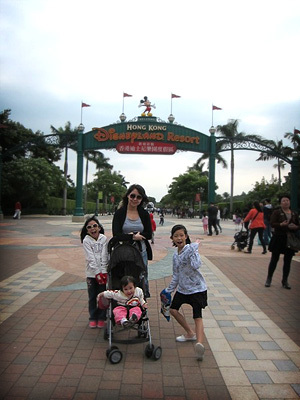 However, all of us were not into rides, so it was more of picture taking and just soaking up the�atmosphere. 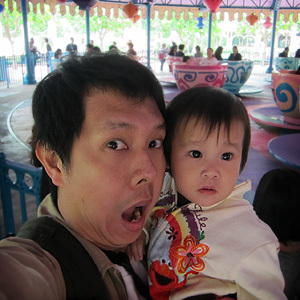 Cli� and Cleo love the Mad Hatter Tea Cups and wanted to do it several times. I did it twice and I’m gonna puke my lungs out. I had to hold Clara, hold the iPhone while I recorded a video and you can imagine how disoriented that feels. The weather changed when we were there. It dropped from 18 to 12 and we just had to go back to the hotel to wear more clothes. We went back in the early evening and it started to snow. Yes it snowed. lol… fake snow. We stayed for the fireworks and did some�souvenir�shopping then headed back to order room service in the beautiful hotel room. Clara is beat. She had her milk and went straight to sleep. We had breakfast in the Enchanted Garden in the hotel. Its had a real nice entrance. The variety of food was really good. From western, to asian, to indian. 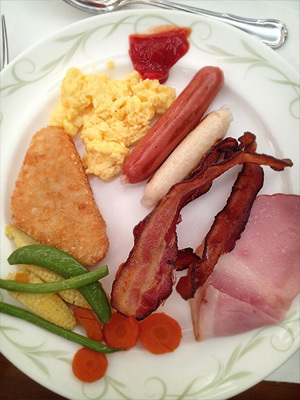 You can really have close to anything you can�imagine�for breakfast. It was Day 2 in Disneyland and unfortunately the cold was too much for Cleo and she ran a temperature. 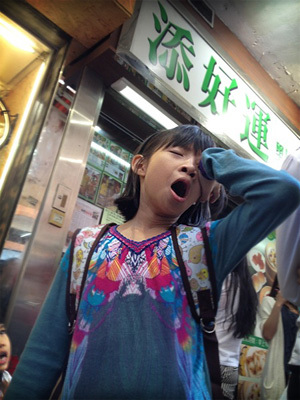 She was listless and did not really want to do much. What a pity. Cli� and Clara on the other hand was really enjoying themselves. 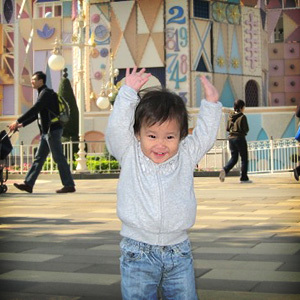 Clara really enjoyed the Its a Small Small World ride and even when she came out, she was still super happy and excited. 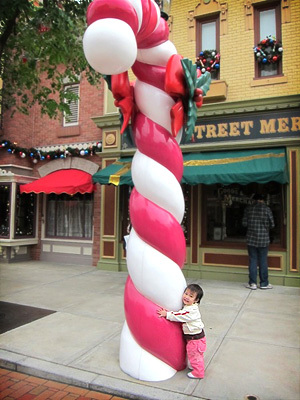 She spotted yet more giant Candy Cane! and this Photo is simply amazing. Its now my iPhone wallpaper. 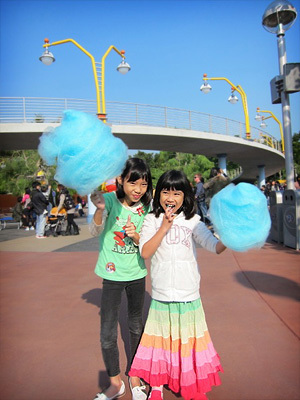 There were blue candy floss being sold, so we got them for Cli� and Cleo. 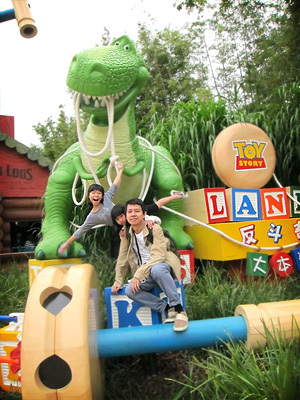 They really enjoyed it and the whole day was just like a fairytale. 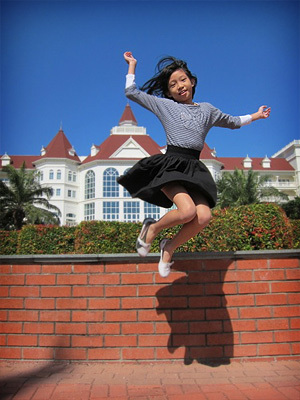 All in all, we did quite a�number�of shows and explored the entire park. We did not stay for the fireworks, but went back to our room to have room service again for dinner in the hotel. We just lazed around in the room and the kids played with their new purchases. We had breakfast again in the�Enchanted�Garden. 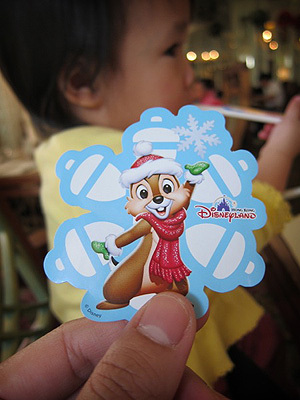 Did you know that everyone that works in Disneyland have stickers in their pockets. They give them out to kids when ever they see kids. So you can safely say my kids collected loads of stickers and Clara have some of the nicest ones. The best part of having breakfast here is that they Disney characters will walk around and take pictures with you. Clara really loves it. Just look at how she smiles in this picture. Its the last day of our trip, so we just walked around the hotel and sat at pretty places to take pictures. Guess what, almost every flight there is a crying baby and on this flight I know the baby very well. 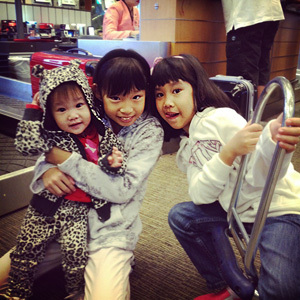 This school holiday, Pearl planned for the whole family to make a trip to Bandung to visit her sister’s family. They were there as her husband was posted there for a year and the family is putting up at a nice big house that could�accommodate�us and more. My in-laws went too. The kids were counting down to this day since mid Jan i think. The house is really huge. This corner have got to be my favourite as it had a loft. The sheer�existence of this loft broke the structure of the whole house. So its quite clear that the architect meant for this part of the house to be a key feature. Its also cool that the pendant globe lights added to its ambience at night. 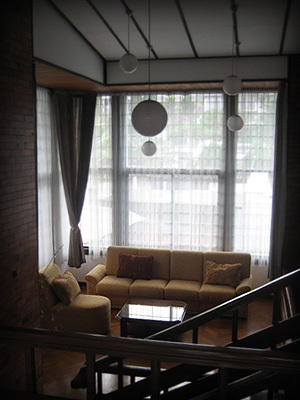 This is just one of the three “living rooms” of the house. 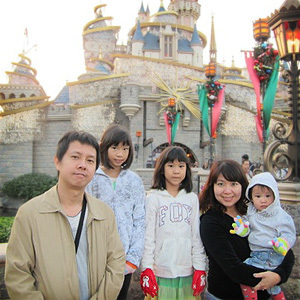 The family had a house keeper, a baby sitter, a�gardener�and a driver. So these 4 people were somewhat at our calling. I so can’t get use to this. The first morning, we went to De’Ranch. 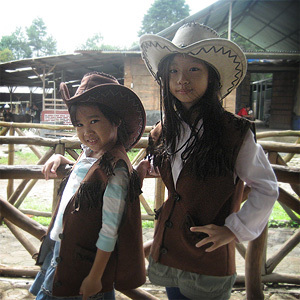 It was an outdoor place where kids could ride horses, do some fishing, do rock climbing, etc. 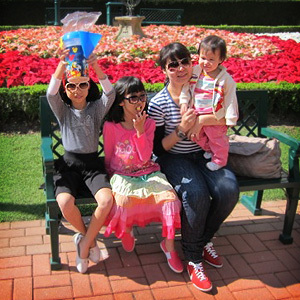 Its quite a nice day out with kids kind of place. 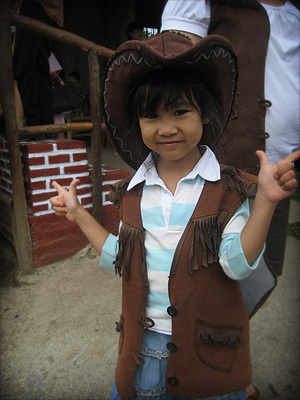 Cleo loves the horse ride and thinks the cowboy outfit suits her well. She somehow knew that cowboys had guns. 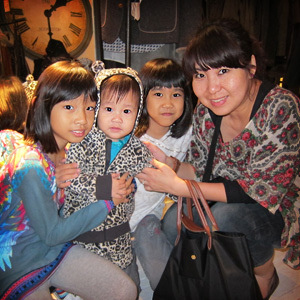 Most of the other days was spent travelling around Bandung going from factory outlet to malls, to salons, etc. 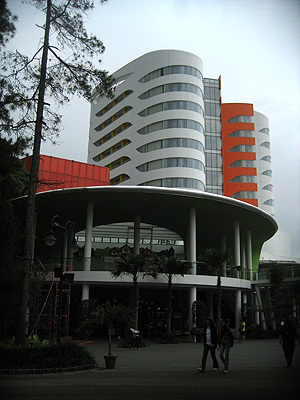 This here you see is the Sensa Hotel at Cihampelas Walk (aka CiWalk). It really stood out from what Bandung is. But the hotel that i really wanted to see was Hilton Bandung as a good architect friend of mine told me its one of the nicest buildings in Bandung. I managed to pass by it at night and it looks great even at night. 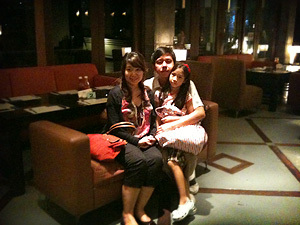 One of the days was spent almost fully at Bandung Supermal. 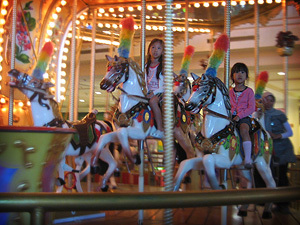 It had a huge indoor amusement park Kota Fantasi. There was even a rollercoster, bumper cars, games galore. The amazing thing was Cleo wanted to sit the bumper car and she sat for a total of 6 times and she is really good at driving. She also did the row boat thingy twice. Cleo ran off too quickly, did not manage to get her for this family shot. 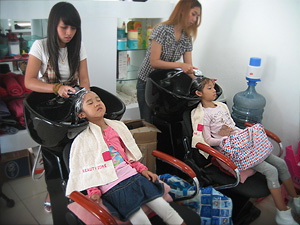 Since mommy and grandma wanted to experience the very amazingly affordably wash and blow, the kids also joined in. They even got their nails done. We found out that these girls that worked in the salons are not even getting SGD100 per month as basic salary. What a huge difference our economies are. Both girls also got their hair cut at Paris Van Java. Its now super nice with layer and all. 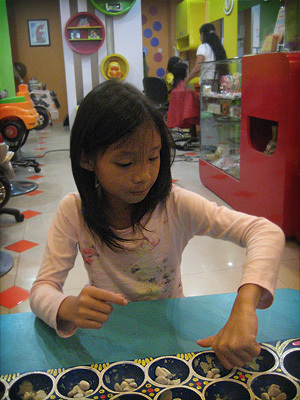 While Cleo was getting her hair done, Cli� and me had 2 games of Congkak and she won both times. That evening also went to catch Alice in Wonderland at the mall. Since the house had a little BBQ shelter, we had a BBQ. Cool weather, hot food, beer and my loved ones. 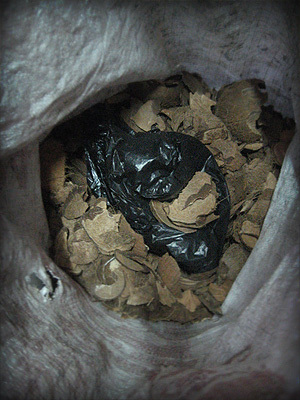 The cool thing is that charcoal was not used, instead we used coconut husks. Apparently its very common. Lots of smoke, but other then then, no soot. way cool. 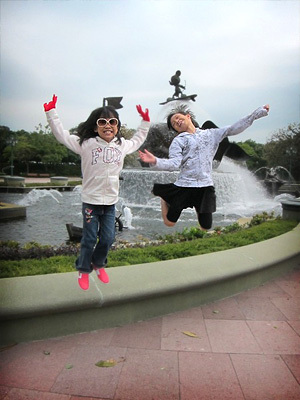 During this trip, the girls got exposed to another country, a country not like Singapore. They were�genuinely�curious why were there kids begging on the roads, why were there potholes everywhere. 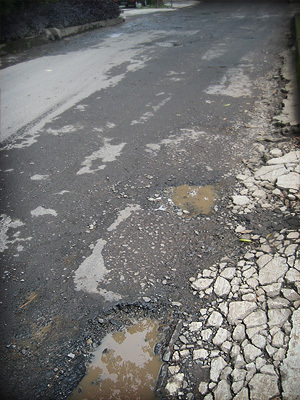 Cli� asked me, “Daddy, why the road have so many holes”, instead of answering her, i asked her “who do you think should take care of the roads?”, she said “Us! Because we must protect our environment.” KUDOS to MOE for teaching the green movement. I tried to explain the concept of government, but i think its too big a concept for the girls for now. Cleo enjoyed the trip tons and she looks great with bangs and her new layered hair. 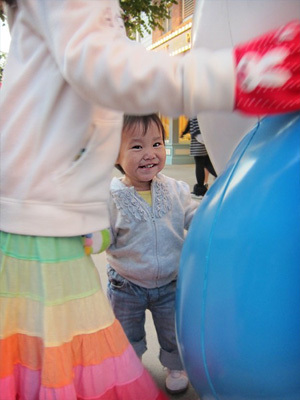 Cli� spent good time with her cousin, but that also mean the fights and quarrels. We managed to do some decent shopping, experienced another culture, got out of the daily routine for a week and its all over in 9 days. The best part for me for this trip is where I got to spend time with my 2 girls one-on-one�and had interesting conversations. I even introduced Cli� to Taylor Swift and printed out Lyrics for her, so now her favourite songs are “Love Story” and “Fifteen”. One big reminder to myself, always check the weather. Don’t assume Indonesia is warm.